Spain is known for volume and it’s known for value. For vaunted wines of international renown? Not as much. Carlos Falcó and his fellow members of Grandes Pagos de España would like to change that. Falcó is one of the founders of GPE, a group promoting estate-grown, terroir-driven wines – pagos roughly translates to “estates.” The idea is that these are wines that can compete with the world’s finest. Widely recognized as a leader in the modernization of Spanish winemaking, Falcó introduced a number of techniques to Spain including drip irrigation. 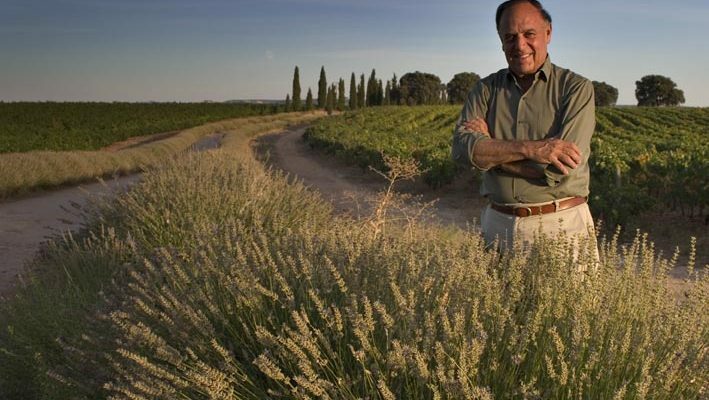 He introduced petit verdot and syrah to Spain and brought cabernet sauvignon to Castilla La Mancha, where his family has owned land for centuries and where he produces wine under the Marques de Griñon label. GPE has an uphill task. Although regions such as Priorat and Rioja have gained recognition among discerning wine drinkers, the Vino de Pago classification, introduced in 2003, is less well known. I met Falcó as part of a trip hosted by Grandes Pagos last fall, my first-ever interview with a Spanish noble. Falco’s full title is Carlos Falcó y Fernandez de Cordóva, Marqués de Griñon, although he usually goes by just the first two names unless, he jokes, it’s for something important like restaurant reservations. Here are his thoughts on the group and its mission. Q: What’s behind Grandes Pagos de España? A: One very important reason is to defend this concept of terroir-based wine, but not terroir as a region but as an estate, which has different soil, different kinds of hill or exposure and a mix of varieties. The fourth factor is the man or woman who makes the wine. Everybody with the same terroir, with the same grapes would make a different wine. Q: Spain doesn’t have the kind of strict regulations of the French classification system. How do you decide whether a winery deserves to be recognized as estate wine? A: For us as a private group, we don’t care so much about what the government says. We just taste the wine see the man who is behind the wines whether he’s credible or not. [A committee vets applications and then the group has to unanimously approve new members.] We need to have five years of, let’s say, proven track record. For instance, we look at points, major critics within Spain, outside Spain, but also restaurant lists. A good measure is also that the wine is exported and is successful not only in Spain, but abroad. One major issue is whether it’s a credible product – they’re not bringing grapes from outside. Q: How are you doing in terms of membership and raising awareness? A: We don’t claim we have everybody who makes top estate wines in Spain, but I think we have a good proportion. We are very young and we’ve only been around for 14 years. I can tell you that we are on the web and also we travel; we have help from the EU for making presentations and trips abroad so we have been quite active in China, Japan, Singapore. A: Most top restaurants in Spain know what Grandes Pagos de España is. It’s difficult to go into a Michelin-starred restaurant where they don’t have three or four Grandes Pagos wines on the list. A: Recognition, and an understanding of the values that have brought us together, not just at a trade level but also with people who love wine. Grandes Pagos de España has become well-known within the Spanish trade and some wine knowledgeable consumers but now we have to take our message about quality and why we are different to a wider public. A: Gaining a reputation for representing some of the best in key international markets, we are investing a lot in communication to help inform experts and consumers alike about who we are and why we are different from other Spanish producers. The U.S. is a very important market for us and one where we want people to understand the quality standard that Grandes Pagos de Espana represents.